When you travel with children the last thing you want to have happen is a medical emergency where you have to communicate with a doctor or emergency medical staff who speak a foreign language. 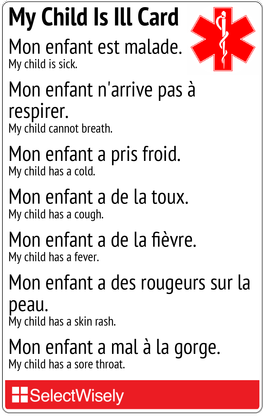 Our 'My Child is Ill' cards provide easy to communicate short sentences that describe the illness your child is having. 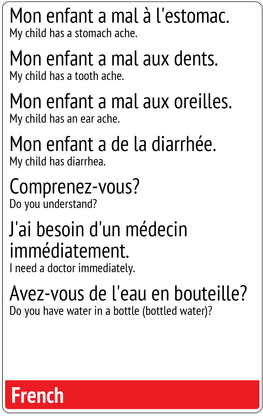 Our 'My Child is Ill' cards are available in various languages such as Spanish, Italian, French, Thai, Chinese and more. These cards are laminated and are the size of a passport. My child has a cold. My child has a cough. My child has a fever. My child has a skin rash. My child has a stomach ache. My child has a tooth ache. My child has an ear ache. I need a doctor immediately. Do you have water in a bottle (bottled water)?